LA Moms Blog: Where Is My Little Emily Post? Please check out my latest LA Moms Blog post, "Where Did My Miss Manners Go?" We're teaching CC her "pleases" and "thank you's," and generally she's been pretty great. Lately, though, there's been a little resistance. It's a bumpy road on the path to good manners, but what should parents of 3-year-olds expect? Hope you have a wonderful and safe Memorial Day! Dwayne Johnson, Stephen Merchant and Julie Andrews star in "Tooth Fairy." First off, I wanted to thank everyone who participated in the "Tooth Fairy" giveaway. I laughed out loud at some of these stories! Since I wanted to spread the wealth a little bit, the winners are Annalene -- who will get her first Tooth Fairy visit -- and PixMom. Congratulations! 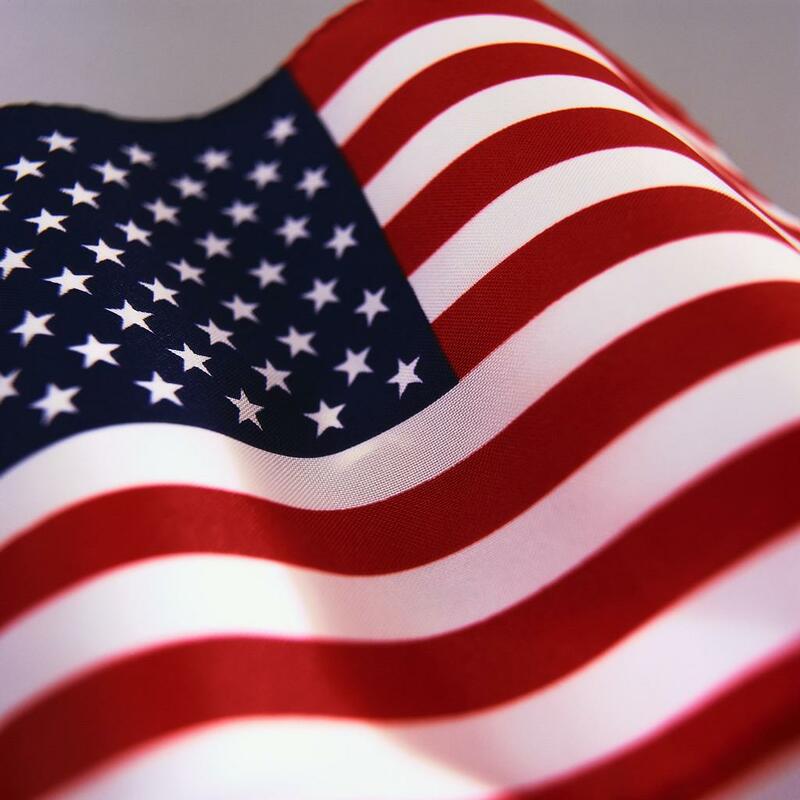 Have a great Memorial Day weekend, and stay tuned for more giveaways! Samantha Brown takes a ride in Palm Springs. Summer is just about here, and Ian, CC and I are thinking about places to go to get out of town. We're probably going to stick close by, and we've already taken road trips to Las Vegas and Santa Barbara. Where else should we look? Luckily, there's Samantha Brown and the Travel Channel. Just so you know, I love her. I faithfully watched her Passport to Europe (yay Berlin!) and Passport to China series as well as her Passport to Great Weekends, which included a visit to Los Angeles (hello, surfing rabbi!). Her latest incarnation is "Great Weekends," which airs on the Travel Channel Thursdays at 10 p.m. ET/PT. And tonight, she's heading to Palm Springs. We've never been to Palm Springs, but I've heard that it's so much fun. Ian's not a desert-y kind of guy (except for Vegas), so he's never been that excited to head east toward that infamous dry heat. And besides awesome pools, is there anything for the kiddo to do? Tonight, Samantha explores the retro version of what used to be Rat Pack Central. She also dons roller skates around town and sets out on dune buggy adventures. While CC might be a little too young to hang in a revamped Frank Sinatra eatery, she would definitely love the outdoor fun that the city promises. There's lots of hiking, lounging by the pool, but there is also the nearby Children's Discovery Museum of the Desert, which features hands-on exhibits for kids of all ages. Palm Springs is definitely on the long list of places to visit, and hopefully we can make the short trip this summer -- especially if I can get CC to sing "My Way." Downtown L.A. is getting ready for its closeup, as the Los Angeles Film Festival prepares to kick off its 16th incarnation June 17-27 at new digs L.A. Live. The festival, which I'll be covering from a family-friendly point of view, will host more than 200 feature films, shorts and music videos from over 30 countries. It will also serve as the world premiere venue for 3D animated film "Despicable Me," featuring the voice of Steve Carell as super-villain Gru, who sets out to steal the moon. That's in addition to opening night film "The Kids Are All Right" and the third entry in that little vampire franchise (you might have heard of it) "The Twilight Saga: Eclipse." Lucky for parents, there are plenty of films ($12 per ticket), conversations ($15), free screenings and other events on tap that would be great for Date Night (remember that?) or for enjoying with the whole fam. Tickets go on sale June 1 at 10 a.m., and passes are already available. * "Waiting for Superman" -- Oscar-winning documentary filmmaker Davis Guggenheim explores and exposes our public education system in this moving, hard-hitting -- and hopeful -- look at our schools and the kids whose futures depend on them. * "The People vs. George Lucas" -- Are you in a love/hate relationship with George Lucas? This hilarious, heartfelt documentary asks who rightfully owns Lucas' cultural legacy and that galaxy far, far away -- the man who created it or the fans that embraced it? * "Make Believe" -- Armed with magic hoops, decks of cards and homegrown illusions, six hopefuls from around the world prepare for Las Vegas' World Magic Seminar and the chance to win the title of Teen World Champion. * "Pee-Wee Herman's Big Adventure" -- This fun film from the '80s will celebrate its 25th anniversary at the festival. Talk about a blast from the past! There are so many more films to choose from, as well as conversations with Hollywood types like Ben Affleck and Sylvester Stallone, and libations at the ZonePerfect live.create lounge. For more information on Film Independent's Los Angeles Film Festival, visit www.LAFilmFest.com. As a bonus, I'll be giving away fun prize packs throughout the festival! In this post, I'm giving away a 4-pack of tickets good for selected Los Angeles Film Festival screenings plus 4 passes to the ZonePerfect live.create lounge (21 and over only). 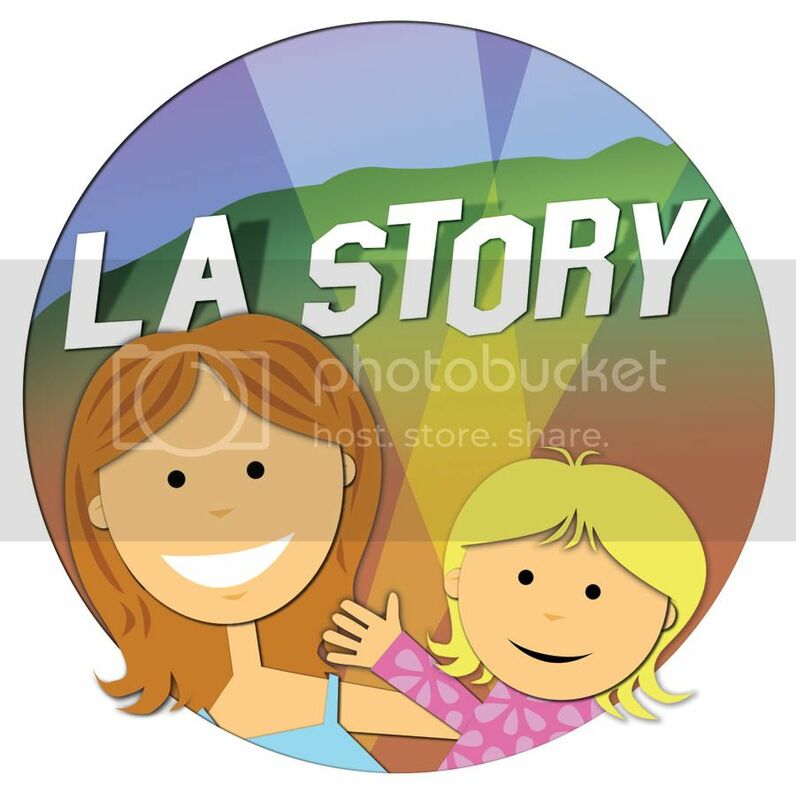 If you click "Like" on the L.A. Story Facebook fan page, I'll throw your name in twice! Good luck, and I'll announce the winner Friday, June 11! UPDATE: All 250 "Juno Baby" DVDs have been claimed. Thanks again to all who signed up! When it comes to new and interesting family-friendly products, sometimes moms would like to try them out for themselves, instead of, say, just reading about them online or in magazines. That's where new product relay company Heard It From A Mom comes in. With HeardItFromAMom.com (HIFAM), moms can try out new products for free. If you like it, HIFAM will send moms that you recommend the same product to try -- also for free. In turn, those moms can recommend their friends, and so on and so on while supplies last. So what's the latest product on offer? Juno Baby is a series created by Belinda Takahashi, Ph.D., that mixes music with age-appropriate learning. In the "Juno Baby: Way to Go, Juno!" DVD, Juno and her friends learn how to overcome such fears as the dark, getting a first haircut and even eating broccoli. But they do it through friendship and music that is not only vibrant and joyful but also fun. Tailored for kids ages 18 months to 5 years, the DVD mixes original music from Takahashi with classical fare from composers Handel, Brahms and Mendelssohn. CC was entertained by Juno and her friends Bunny, Baby Rai Rai, Buzz the Bee, Murphy the Caterpillar and Indie the Cat. She kept asking, "Where's Juno? Where's Juno?" whenever the long-haired little girl wasn't onscreen. The songs and characters were all sweet and encouraging, willing to help each other out to overcome their fears. 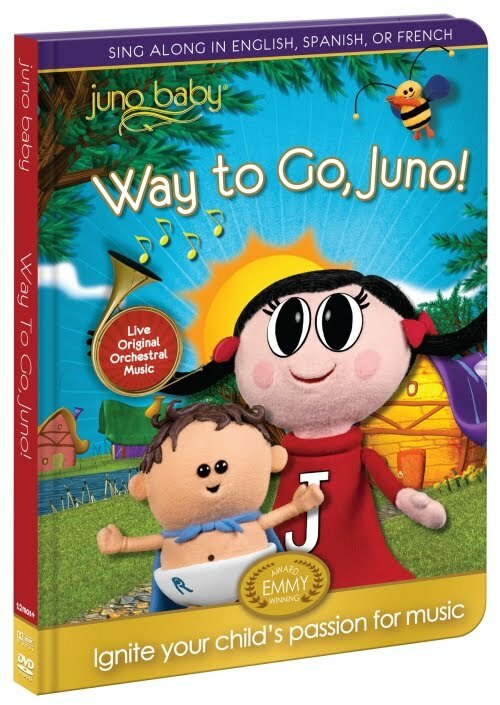 Click here to receive your free "Juno Baby: Way to Go, Juno!" DVD. If you like it, tell your friends to click here to get one, too. CC plays online game "Disney Fairies Pixie Hollow" at Hollywood & Highland. Any day that my child can play a game involving Tinkerbell or "The Lion King" ditty "Hakuna Matata" is a good day. Lucky for CC, Disney Interactive Studios and Disney Online hosted a blogger night last week at Hollywood & Highland's Vantage Dining Room, complete with Wolfgang Puck Catering (hello, gourmet Ding Dongs and Twinkies! ), goodie bags and tons of video games for the little ones. While there was an array of kid-tastic computer madness -- including a few iPads floating around the room -- CC gravitated to a couple of games she loved, one of which literally made her sing. After a brief pit stop at "The World of Cars Online," where CC engaged in some noisy tractor tipping with Mater and Lightning McQueen, she made her way to one of her two fave games of the night -- Disney Fairies Pixie Hollow. PixieHollow.com is a virtual Tinkerbell-infused world where kids can create their own fairy and go exploring, play games, shop for fairy fashion and earn badges. There are lots of options and areas for tykes to investigate, and CC loved changing her fairy's costume and collecting things like berries and leaves. CC's other favorite game was "Disney Sing It: Family Hits" (right), featuring kiddie karaoke of Disney songs from movies such as "Cinderella," "Beauty and the Beast" and the recent "The Princess and the Frog," among others. But after a fun night of gaming, singing, chatting with fellow moms and gorging on Wolfgang Puck fare -- did I mention the hand-made Ding Dongs? -- we needed to head for home. As we were leaving the fifth floor of the dramatic Hollywood & Highland structure, CC and I noticed that a film was playing on one of the rooftop walls as nighttime was quickly approaching. That film? "Casablanca." Disney and "Casablanca" in one night? Yes, folks, this is definitely Hollywood. 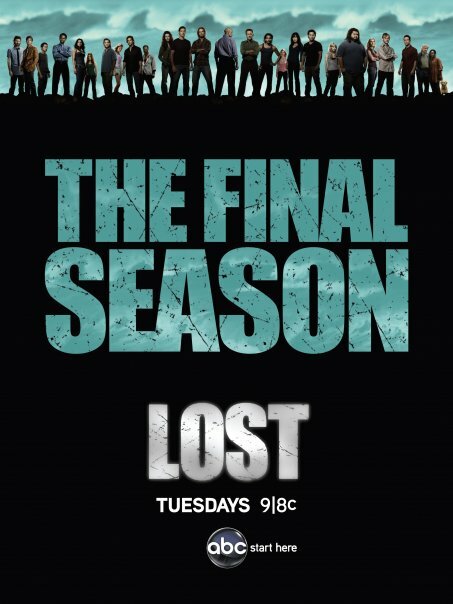 Yes, I found a way to work my favorite TV show, "Lost," into a mom blog post. As the series ends tonight (sniff), it marks the end of an era -- but also a new beginning for me as the mom of a preschooler. 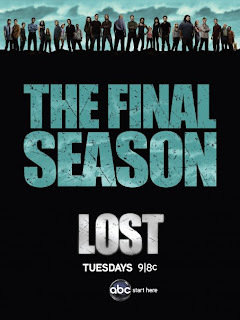 That said, please check out my LA Moms Blog post, " 'Lost' May Be Over, but It's Just the Beginning." I always thought Dwayne Johnson, aka "The Rock," was a good sport. Once, I saw him on an episode of "Hannah Montana" (shh, don't tell) wearing lipstick and what looked like Lee Press-On Nails and thought, this guy must be a great around kids ... or just a glutton for punishment. Well, in Fox's "Tooth Fairy," Mr. Johnson (Mr. Rock?) shows he can play both a good and bad sport in his role as minor league hockey player Derek Thompson, who's known for knocking out the competition's teeth -- and for crushing little kids' dreams. It's after he tries to tell his girlfriend Carly's (played by Ashley Judd) daughter that the real Tooth Fairy doesn't exist that he gets into the biggest trouble -- tutu-wearing trouble, that is. 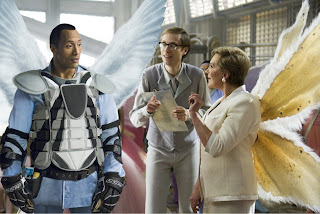 He is then summoned by the head fairy (Julie Andrews) via the super-tall and endearing Tracy (Stephen Merchant) to serve a week's time as a real Tooth Fairy to the kiddos. At first, as Twentieth Century Fox mentions, he "can't handle the tooth," but it's through his efforts to make kids believe that he sees what's missing in his own grumpy attitude. When we sat down to watch the movie, I wasn't sure what CC would think. So far, the excitement has been her growing baby teeth rather than losing them. And I don't know that she fully gets the whole Tooth Fairy business. But she enjoyed seeing a little girl in the movie who was about her age. "Where's the little girl, Mommy?" she asked every time Ashley Judd's daughter (played by Destiny Grace Whitlock) was off screen. I think she saw a potential playmate. But I was happy to see Johnson's downtrodden, bad sport of a hockey player turn into the warm and fuzzy kids' guy that I thought he was. He was convincing as a dream-crusher, but also refreshingly heartfelt as a good guy once he realized the, er, tooth. 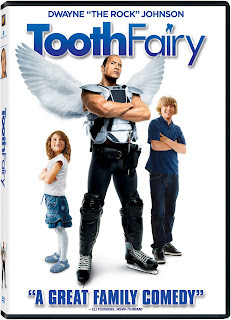 I'm giving away 2 copies of "Tooth Fairy," courtesy of Twentieth Century Fox Home Entertainment. Just leave a comment below, telling me your most memorable Tooth Fairy story. Good luck, and I'll announce winners on Friday, May 28! Congrats to Cheryl and FabuMom for winning the "Care Bears: Share-a-Lot in Care-a-Lot" DVDs! I loved hearing about faves Good Luck Bear and Sunshine Bear. Have fun checking out the share-friendly episodes with your kiddos! Just shoot me an email at losangelesstory@gmail.com with your address, and I'll send them along! Ian and CC "pet" some stingrays at the Aquarium of the Pacific. Sunday night offered some otter excitement, as the Aquarium of the Pacific in Long Beach hosted a special members night to preview its new Molina Animal Care Center and newly renovated BP Sea Otter Habitat. CC was really excited to catch a glimpse of Maggie the sea otter as well as get all touchy-feely with some sharks and stingrays. Yes, really. But not only were the sea life out in full force, the Aquarium also had fun activities for kids, including facepainting, arts and crafts, and short aquatic-themed films. The Aquarium of the Pacific is great, in that it gives visitors a true hands-on experience. The outdoor Shark Lagoon invites children and even some nervous adults to plunge their arm into a shallow pool to run their fingers over smooth shark skin. (OK, so the sharks are aren't "Jaws" size, but still.) The Lorikeet Forest aviary gives you a taste of "Mary Poppins," as birds feel free to land on whatever perch is preferable to them -- your shoulder, maybe. You might want to bring a water-proof jacket for the kiddos, because the outdoor play area sports over-sized fish that squirt water, much to the delight of every nearby child. While CC enjoyed playing outside, watching Maggie the new sea otter swim here and there, and petting pint-sized sharks, what she loved most about the night were the "Nemos" (above photo). That is, the adorable clown fish that were more than ready for their own close-up. 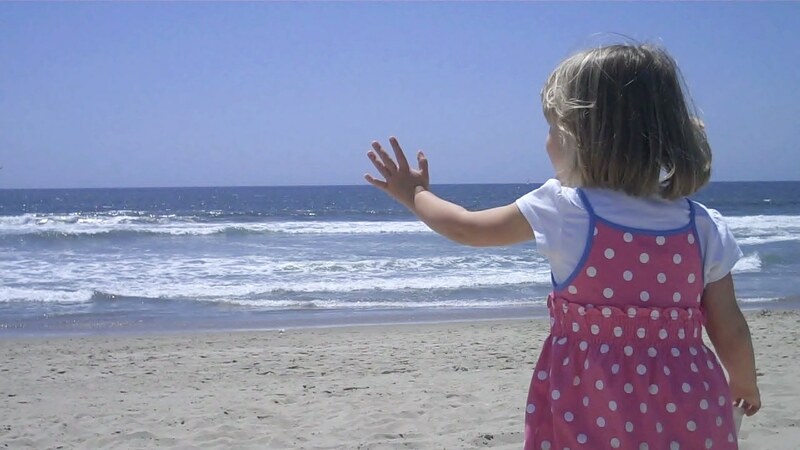 Sometimes -- especially on rainy L.A. days like today -- it's amazingly awesome to think about a gorgeous day at the beach, if only to remind us Angelenos why we're so lucky. I love this picture of CC, taken a few weeks ago at Venice Beach. She's waving to Ian, who's walking on the nearby pier just out of the frame. My child is fully clothed in this photo, but it didn't take her long to show off her sea legs. Literally. If she could have, she would have swum as far as the waves would take her. Instead (partly because of this roving helicopter parent *ahem*) she had to settle for soaked toes and a very sandy bottom after making little winged angels in the sand. Ian, CC and I were invited to the California Strawberry Festival in Oxnard. From strawberry shortcake to strawberry nachos and strawberry popcorn, the aptly named California Strawberry Festival offered lots of unconventional options to fans of the ripe, red berry. And, don't forget about the chocolate-dipped variety. It was a surprisingly chilly day on Saturday, when CC, Ian and I drove up the Pacific Coast Highway to Oxnard, but that didn't stop us from partaking in the food-alicious fun as well as a little magic show for the kiddo. There were tons of tents and vendors at the festival, which also offered more conventional fare including hamburgers, hot dogs and kabobs, but our first stop was, of course, the strawberry shortcake tent. Now that was a dangerous place. For $5, you could make your own dish, and I have to admit that I was tempted to pile on the strawberry goodness, Mongolian BBQ-style -- but I refrained. Ian CC and I did dive right in, whipped cream and all, and we were on a sugar high for the rest of the fest. We opted out of the rides because the lines were super long, but we were able to catch a lively magic show in the Jest for Fun tent. CC sat right up front and several times tried to hop on stage while Godfrey the Magician worked his magic. Lucky for him, though, there was toddler security -- a very nice young woman who encouraged the kids to stay seated and not storm the stage. But perhaps the most special treat for CC -- and a great capper for the day, in addition to the chocolate-dipped strawberries -- was a photo op with the *real* Strawberry Shortcake, who acted as the festival's Berryfest Princess. CC is a huge Care Bears fan, and she comes by it honestly. After all, her mother also was a fan of the cuddly little creatures a mere *cough* years ago. 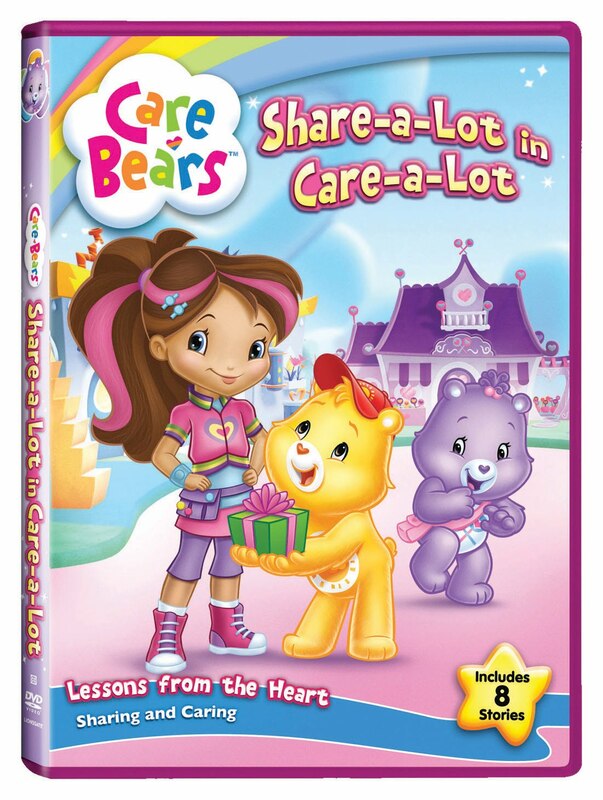 So when I received the franchise's latest DVD, "Care Bears: Share-a-Lot in Care-a-Lot" ($14.98), from Lionsgate Home Entertainment, CC tested her own sharing capabilities when she tore open the plastic wrapping and shoved it into the DVD player. The eight episodes in "Share-a-Lot in Care-a-Lot," which hit shelves on May 4, are adorable and, of course, kid-friendly. Geared toward ages 2-5, the shows tackle such themes as sharing (natch), and how to make up with friends after they've hurt your feelings. Mostly, the little bears want to teach others -- be it Grizzle, the power-hungry mini bear or little girl McKenna -- to just care. In the first episode, "Re-Booted," the robot-obsessed Grizzle has been kicked out of his floating lair by his own new robot and lands in Care-a-Lot grumpy and confused. The Care Bears, being the sweet cuddle bears that they are, welcome Grizzle and actually play with him. Will all that caring soften up the little grumpster? When little girl McKenna arrives in Care-a-Lot in the episode "Here Comes McKenna," one of the Care Bears tells his friends that they have their work cut out for them when it comes to teaching her how to share. But when Grizzle tries to steal all of the Care Bears' belly badges, McKenna has a chance to test what she's learned. I'm giving away 2 copies of the "Care Bears: Share-a-Lot in Care-a-Lot" DVD. To enter, leave a comment here telling me your favorite Care Bear and why. If you add yourself to my Facebook Fan Page, I'll enter your name twice. Good luck, and I'll announce the 2 winners on Friday, May 21! CC donned her Junior Conductor hat and showed off a little choo-choo soul last Saturday during the National Train Day festivities at Union Station. It was a packed afternoon at the downtown depot, as parents and kids lined up for model train viewing, live entertainment, outdoor exhibits and goodies that included balloons and train-centric photo ops. Not only did CC get the chance to play in the AmtraKids Depot (right), which offered lots of fun train-centric toys for the little ones in a corner of the main stage area, she also got to catch a performance from Radio Disney entertainers. We also caught glimpses of the Railroad Braceros exhibit, which honored the thousands of Mexicans who were asked to come to the U.S. during World War II to build and maintain our passenger railroad system, as well as the culinary demo by Chef Marcel Lagnez. After grabbing a bite to eat and letting CC shake her groove thang with Radio Disney, it was time to head home. "I want to ride the train, Mommy," CC said as we were leaving. If only Amtrak made a stop on the Westside. 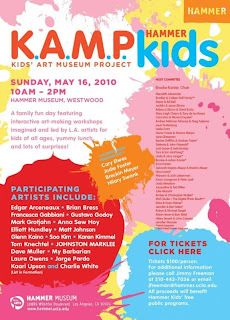 The Hammer Museum in Westwood is launching its inaugural kid-focused Hammer K.A.M.P. (Kids' Art Museum Project) on Sunday, May 16, and it sounds amazing. From painting to sculpting to photography, professional artists will lead workshops for children ages 4-14 in the Hammer courtyard. Not only that, but there will also be story time, with readings from actors Cary Elwes, Jodie Foster (! ), Breckin Meyer and Hilary Swank. From 10 a.m.-2 p.m., the event will offer kids and their families access to the museum's exhibits and galleries, as they participate in the workshops led by artists including Edgar Arceneaux, Brian Bress, Francesca Gabbiani, Gustavo Godoy, Anna Sew Hoy, among others. Keep in mind that the day camp is not inexpensive. Tickets are $100 per person. I know I usually focus on wallet-friendly adventures, but this just sounds cool. Plus it's the museum's first year hosting the event, and hey, maybe you'd like to save up for next year. Also, all proceeds will benefit Hammer Kids' free public programming -- always a worthy cause. What: K.A.M.P. 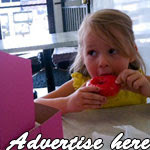 - Kids Art Museum at the Hammer Museum with artist-led workshops, story time and lunch. Ticket information: Tickets $100/person. For additional information, please call Jimmy Freeman at 310-443-7036 or email jfreeman@hammer.ucla.edu. All proceeds will benefit Hammer Kids’ free public programs. Purchase tickets online on the Hammer’s website: http://store.hammer.ucla.edu/K_A_M_P_p/tickets-k.a.m.p.htm. The 27th annual California Strawberry Festival kicks off this weekend, May 15 and 16, in Oxnard, and Ian, CC and I are on board for some seriously juicy fun. We've never visited the festival, but who can turn down a nice drive out of the city, fun attractions including "Spaberry" treatments and Strawberryland for Kids featuring Strawberry Shortcake, the official Berryfest Princess? And the strawberries, of course! Tickets to the event range from $5-$12, with kids 4 years old and under free. When we drove up to Santa Barbara last month, we passed Oxnard and its expansive strawberry fields, and we'll most likely do the same on this trip. However, Amtrak is offering a special discount if you want to take the kiddos on a fun train ride instead. In addition to the kids' area, which will feature free rides and attractions, the festival also promises live musical entertainment, arts and crafts and recipe contests. And if we were able to go Dodger dog crazy, imagine what we can do with those awesome little berries! May 15 and 16; 10 a.m.-6:30 p.m.
CC gets her groove on at Dodger Stadium on Mother's Day. My little Dodgers fan was ready and willing to show her support for the home team on Mother's Day, when we were invited to take in the game from the Dodgertown, Mothers section of the stadium. "Let's go, Dodgers!" CC yelled while clap clap clap-clap-clapping and telling me to "Cheer, Mamma, cheer!" To celebrate Mother's Day, the Los Angeles Dodgers converted their themed My Town section into a rosy-hued haven for the mommy set. Not only did they offer the signature pink T-shirt, but they also had a special inclusive menu of grilled chicken sandwiches, fruit and Dodger Dogs, among other treats. Let's just say CC and I went a little Dodger Dog crazy. It was fun seeing the sea of pink shirts while watching the game against the Colorado Rockies -- which the Dodgers beat 2-0. We were especially happy to cheer on No. 14 Jamey Carroll (whose wife, Kim, I recently interviewed), when he hit a single and helped Blake DeWitt score the first run of the game. Nice also was seeing the team literally "Going to Bat Against Breast Cancer," a program started by Major League Baseball to raise awareness for breast cancer. Players Russell Martin, Andre Ethier and James Loney swung pink bats in honor of the day. 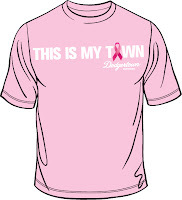 The Dodgers also donated $2 from every Dodgertown, Mothers ticket sold to ThinkCure! to help fight breast cancer. Due to some preschooler naptime needs, we had to leave the game a little early, which meant missing out on the invitation for a Mother's Day Walk in the Park on the warning track after the game. No big deal because it was already an awesome Mother's Day, thanks especially to the best pancake breakfast ever, courtesy of Ian and my little slugger. Enjoy your kiddos and hope all you awesome moms get spoiled today! Moms from all over Los Angeles gathered together on Saturday to Help A Mother Out, donating Huggies, Luvs and Pampers to the California-based organization that provides diapers to families in need. Thanks again to Kim Tracy Prince (pictured below in awesome '40s attire), who blogs at House of Prince, for organizing another fun and worthy event that brought in a whopping 3,284 diapers for the mom-friendly organization. Besides feeling good about being a part of something that helps others, it was also a fun night out for moms. I got to connect with fellow LA mom bloggers Sarah (Mar Vista Mom, The Open Daily), Yvonne (YvonneinLA), Ana (SpanglishBaby), Donna (SoCalMom) and Andrea (SavvySassyMoms), as well as Tania (PureNaturalDiva), who offered her home for the festivities. Not only was there great conversation, but also good food, courtesy of Fresh & Easy, Tillamook and Steaz Teas. A game truck even showed up as I was leaving, filled with leather couches and big-screens offering games such as Guitar Hero. It's always nice getting together with the grown-ups (yes, CC was at home with Ian for this outing), and it was even nicer to know that it was for a good cause. For more information or to donate to Help A Mother Out, click here. CC watches nearby skin treatments at Dermalogica on Montana. Last weekend, Dermalogica on Montana hosted a lovely pre-Mother's Day party for a few moms like me, and CC was not about to miss out on the fun. When she asked where we were going, I told her that Mommy was going to get a facial -- "Microzone treatment" would have been a little tough for her to digest -- and she said, "I want a facial, too!" As adorable as that would have been, she opted to sit this one out and watch as mothers received flash exfoliation or eye revitalization treatments (in addition to skincare-friendly goody bags) and their tween girls got fun advice on how to care for tricky teen skin. I've been invited to Dermalogica a couple of times, and each time has been an amazing experience. The hour-long skin treatment ($85) is definitely a relaxing break from the day-to-day craziness. While you lie tucked comfortably into a warm, cozy bed, a skin therapist exfoliates, extracts, tones, massages and leaves your skin feeling clean and healthy. The Microzone treatment, which I experienced for the first time this past weekend, is a 20-minute option that offers a quick, casual treatment for a mere $25. Not bad. I had the flash exfoliation, and I left looking dewy and refreshed. One fellow mom even said I was glowing. Ah, (exfoliated) youth. Load up your little choo-choo aficionados and head down to Union Station on Saturday, May 8, for National Train Day 2010. The free event, which will take place in downtown Los Angeles from 11 a.m.-4 p.m., as well as in other cities such as Washington, D.C., and Philadelphia, is a fun day for the kiddos. Activities include model train and regular train equipment displays and live performances from Playhouse Disney's Choo-Choo Soul with Genevieve. How appropriate! CC and I went last year and had a great time. She donned her little engineer's hat like a true trainspotting tyke and leaped on the nearest kid-sized choo-choo, ready to embark on an (indoor) railroad adventure. Kim Carroll, wife of L.A. Dodgers infielder Jamey Carroll, cuddles with her twins in the stadium's family room. I've always thought of baseball as a dad kind of thing. After all, it was my dad who took me to my first baseball game and my first Yankees game -- his favorite team, thanks to Oklahoma-born Mickey Mantle. But it's the Los Angeles Dodgers, my daughter's hometown team and one she cheers on heartily, that are celebrating Mother's Day in a special way this year. On Sunday, May 9, they're devoting their popular My Town section to moms. And speaking of moms, I also had the opportunity to chat with Kim Carroll, wife of Dodgers infielder Jamey Carroll and mom of 2-year-old fraternal twins Cole and Mackenzie. 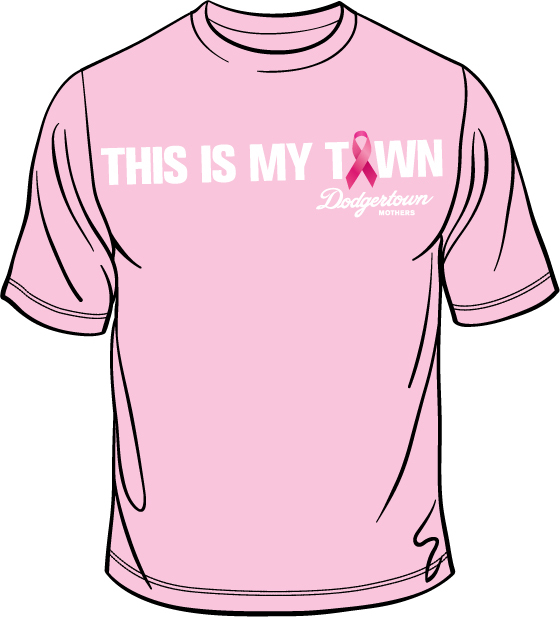 Kim and her kids will be at the day game on Sunday (after the twins take their nap, she said), when fans who buy seats in the special Dodgertown, Mothers section will receive pink Dodgertown, Mothers T-shirts (right). There also will be a special all-you-can-eat menu of grilled chicken sandwiches with marinated artichokes and fruit, as well as that L.A. baseball staple, the Dodger Dog. And $2 from every ticket sold will be donated to ThinkCure! to help fight breast cancer. I caught up with Kim last week in the adorably decorated family room of Dodger Stadium. It was an evening game, and she had her son and daughter outfitted in pajamas just in case they fell asleep while Dad Jamey was slugging it out on the field. She and her family recently moved to L.A. after Jamey joined the Dodgers from the Cleveland Indians. "We're really enjoying ourselves, and everybody's been super warm and welcoming, so it's been a great experience so far," Kim, who's originally from Florida, said about their new city. Mother's Day is doubly special for the Carrolls since they have twins, but Kim said the holiday used to be a tough one. "We had a very difficult time having children," Kim said, "so Mother's Day ... it used to be kind of a painful holiday, and it was so exciting when we finally were able to have kids. So that first Mother's Day was just really special." "And it wasn't anything that happened," she added. "It was just more or less that we felt so blessed that we were able to finally have children." And though her children are twins, Kim said they each definitely have their own personalities. "He's 100% boy, and she's 100% girl, so it's definitely interesting to see the gender differences when they're growing up at the exact same age." She also mentioned that this is the first year the 2-year-old duo are really starting to understand that their dad is a big-time baseball player. "Every time that my little boy, Cole, sees somebody wearing something Dodgers -- which, obviously in L.A., is everywhere we go -- he says, 'Dodgers! Dodgers! Dodgers!'" Kim said. "And they're enjoying watching the games." "I think it's still a little weird to see their dad on TV," she added, "but overall they're Dodger fans now." Go Dodgers and Happy (early) Mother's Day! Sunday, May 9 | 1:10 p.m. Please check out my latest LA Moms Blog post: "Sleep Is for Wimps." The kiddo has decided that nap time is too boring, and now she wants to "play all night long."